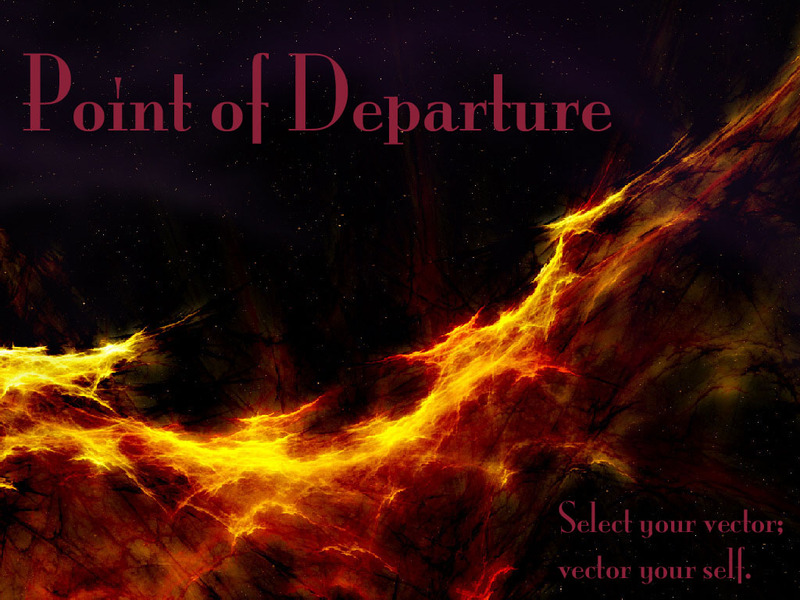 The Point of Departure web site is an "umbrella" for many projects. Besides acting as a cross-pollenation area, it will contain a robust set of "clarifications" which will support all sub-projects by defining terminologies and concepts in a dynamic and multimedia'ed manner. For a better understanding of our overall purpose, please read the "Mission Statement". If interested in associating, please contact the administrator. As securing each project is a high priority, we will unhesitantly take retaliatory actions against spies, hacks, agents, bullies, and other psycho-scum working in league with the Realm. The Adventures in Dialectics site is a venue where texts, provided to the site under anonymous or pseudonymous authorship, concerning the tradition of dialectics — in philosophy, in the sciences, in mathematics, and in Marxian Theory — are made available for free download. The purpose of this new blog is to update participants in the Dialectics.org website regarding news, developments, and plans of Foundation Encyclopedia Dialectica [F.E.D.]. Beyond the Choiceless Choice is a web store wherein I can design buttons, stickers, books, pamphlets, and shirts. If ordered I can add a % onto their base price. I chose the very minimum of 1%. My base fee per month of $6.95 has not been covered so far. The graphics and expository slogans which I created are focused onto long-sleeved tee-shirts of various colors. The stickers come in sizes for bumpers, bus-stops, and as fake advertisements, tickets, flyers. This Yahoo discussion group is formed to explore the primary existential, ontological "self-duality", "self-contradiction", or "internal contradiction" ["intra-contra-kinesis"] of the political economic system founded upon the capital-relation, which deploys it historically as an ascendant-phase, followed by a "descendant" / "decadent" phase, and which makes it an ultimately "self-DIS-organizing system", a self-destroying system, and which calls for its supersession in a higher socio-economic system, characterized by political-economic democracy. This blog addresses the fatal flaw at the core of capitalism as a system of human psycho-socio-political-economic collective self-reproduction, a flaw which ultimately renders it a self-DIS-organizing, self-destroying system — as is becoming increasingly evident. It also details the successor system to capitalism, the new system that represents the higher, positive way forward for humanity: Political-Economic Democracy, or Equitism [see Equitism]. A project aimed at the developing a self-awareness seeking its own self-transcendence, in a radical overthrow of the constrictions and reifications of global capitalism. Within this grand task of world revolution, we hope to find and express the existentialist heart of human subjective experience, the reality of our daily lives, of life as directly lived — where the personal reflects, and then seeks to subvert, our global predicament. Thus, we seek to break the bonds of our social-political-psychological conditioning, in process of radical transcendence of our current social-economic conditions. The Equitarian site is a venue for discussion-texts on past movements, and on convergent present-day movements, which have independently arrived at principles similar to those of the Equitarian Reform / Revolution, as defined in the texts presented on the Equitism site. The Equitism site is a venue for texts, available for free download, on the theory of the Equitarian Reform / Revolution %mdash; that is, for the new constitution, proposed by the anonymous Equitist Advocacy Group, for the institution of Political-Economic Democracy, via the non-violent, legal establishment of the proposed new constitutional equity principles of Citizen Externality Equity, Citizen Birthright Equity, Citizen Stewardship Equity, and Citizen Allocational Equity. This Yahoo discussion group was founded to discuss the predicted successor system to the present, [self-]global[izing] capitalist system. That successor system is named "Political-Economic Democracy" by the Equitist Advocacy Group. "Political-Economic Democracy" is founded upon economic checks and balances against concentrated economic power — concentrated economic power that can subvert political checks and balances via prostitution of governments — as well as being founded on political checks and balances. These new, economic checks and balances, drawing on the "equitable jurisprudence" tradition of Anglo-Saxon law, are instituted via the constitutional establishment of four new classes of citizen "stakeholder" equity rights, in addition to, and in supercession of, the single class of equity operative within capitalist society: stockholder equity. These four new classes of universal citizen equity rights are named, by the Equitist Advocacy Group, as follows — (1) Citizen Externality Equity, (2) Citizen Birthright Equity, (3) Citizen Stewardship Equity, (4) Citizen Allocational Equity. In their totality and in their unity they establish a socio-political-economic system therefore known as "Equitarian Democracy" or "Equitism", and thus with the resulting "Generalized Citizen Equity-Relation" as leading human social relationship of human-societal self-re-production. The Equitist site is a venue for discussing and organizing projects, and other nonviolent activism, pursuant to the Equitarian Reform / Revolution, as defined in the texts presented on the Equitism site. The purpose of this Yahoo discussion group is to explore and assess this new, "Marxian" mathematics. Foundation Encyclopedia Dialectica [F.E.D.] — headquartered at "Stars' End, New York", and at "Terminious, California" — announced a revolution in mathematics, which they also describe as a cognitive revolution, in the form of a new, dialectical mathematics — a mathematics of "psycho-historical" dialectics — including a "purely qualitative" system of "Contra-Boolean Algebra", encoding an algorithmic Dialectical Logic. This "mathematics of dialectics", they say, arises as the positive fruition of an "immanent critique" of standard, "reductionistic" mathematics, and enables the formulation of a "New Model of the Universe", one that embodies a Marxian "Dialectic of Nature". Their discoveries are described in a series of web-published excerpts from a forthcoming book entitled "Dialectical Ideography: A Contribution to the Immanent Critique of Arithmetic". All of the F.E.D. 's web-posted publications carry an "Omni-Copyright" statement, which reads: "Copyright to original portions of this work is hereby granted to all persons." Therefore, even though we have no official connection with the F.E.D., we need have no fear of copyright infringement in citing and discussing the F.E.D. writings. Indeed, it is difficult to envision how an official connection could be established, because F.E.D. appears to be an extremely reclusive organization, having no known mailing addresses, as far as we have been able to ascertain. The F.E.D. Dialectics blog is a growing on-line journal of essays on the Foundation Encyclopedia Dialectica [F.E.D.] Mathematics of Dialectics, written by Miguel Detonacciones, an author who, initially — when he started the blog, in 2011 — was not a member of the F.E.D. collective of "dialectical psychohistorians", but who, in July 2012, became a full member of that collective. Provides interesting perspectives, from both "before" and "after" membership. The F.E.D. Press is releasing books by members of the Foundation Encyclopedia Dialectica. The Global Samizdat site is a venue for the making available, for free download, of texts, under anonymous authorship, analyzing the strategy of the global plutocratic ruling class vis-a-vis the rest of the human species. The purpose of this new blog is described in the 24-January-2014 hypothesis, presented as the first entry, "Global Warming is Just Rockefeller Eugenics Warmed Over – The Real Threat to Humanity is 'Milankovitchian' New Ice Age Global Cooling!" by M. Milankovitch. The Lust for Life web site was my very first. It started with cartoons, comix, and all sorts of categories made up of flyers and pamphlets which I enjoyed, scanned, and type-corrected... into HTML or PDF format. It was intended as a place where people would commit to discovering synthetic line-points between "dots" (which my efforts humbly provide) by themselves, but some people are lazy and have acted as colonized "agents" for universal authoritarian slavisness, choosing to attack any article which made them think "outside of their box" (aka "cage"). They would suppress all use-value within a piece with an absolutist and reactionary dismissal due to a dogmatic view of what "truth" is. They, in a word, were the dictators over everyone else's "truth". Cynically rejecting humanity's dynamicist search for use-valuable kernels-of-itself trapped within everything. The inversion process which sells self-ownership in "exchange" for survival — this political-economy — creates itself universally as our own universalized self-alienation,. These self-anointed "political-correction" experts — censors, witchhunters, lynchmobs, bigots, bureaucrats-in-embryo, dysfunctionals with "elite" credentials — freeze any hostage-freeing "sift" by humanity they are funded to objectify, recuperate, or destroy. Why? Because it challenges the very hierarchy of virulence which heels and feeds them. They stop that self-reinventing, that self-rediscovery, that prison breakout, dead in their own tracks. Posers of the human and imposters of humanity one and all!. By deconstructing down to and magically-connecting form, they clerically disparage content. Thus, always finding the slightest offense to their own surrender's self-trap, they immediately and mediatively foist that same suffocation upon everyone else. Their celebrated pain is a craving for the static, the linear, the flat, the binary, the banal, the false, the anti-dialectical, and basically for continuing to behave like an organic object. With the library, they attacked reminders of their disowned subjectivity whenever they encountered anything NOT smelling that way. Typically, they objectify one group of human beings as "the bourgeoisie" and another as "the proletariat". They do not want faces in either group, and in so doing, demonize both. They want to ration whose owns who so that the State within and behind which they find so much comfort, can facelessly do "politically-correct" stranglings, executions, beheadings, arrests, assassinations, etc. They deny the existence of anyone "behind the curtain". They, at all costs, want to deny the existence of the curtain itself. From now on, these festules will not have access to my work or offerings. They leave a stale and "correct[ing]" rank[-and-file] stench wherever they slither. I am now saying "No to psycho-intellectual parasites!" and to the psycho-terrorsim they pandemically spread to nourish where a subjectivity-embracing soul would be, were they of human rather than ponerolgical origin. This site will soon have a registration-based access. It will also have categories for those sifting 'what is' as [use-]value-added for creating 'what might be'. The purpose of this Yahoo discussion group is to provide a space for discussion of, and, hopefully, for further development of, the theory and practice of the Marxian Dialectic. This Yahoo discussion group is established to provide a space for discussions regarding the Dialectic of Nature. Its purview spans Cosmological Dialectic, and Universal Dialectics, including Mathematical Models thereof, from the perspectives of extending and advancing traditions such as the Platonic, Hegelian, and Marxian dialectical traditions, including that of Frederick Engels's unfinished book manuscript, entitled Dialectics of Nature. Rant-O-Ramathon is a YouTube "television" channel. Everything to which I "subscribe" is made available to those who "subscribe" to (or "follow") my channel. I am trying to find a way to use Tor so that viewers are not going to allow Google to track your world exposing them (and their ilk), else we shall always be one step behind at best. Rasputin's Rant-o-Ramathon is another tool existing in Google-owned terrain. It's more versatile than WordPress. To bring the most people to the blog, you must allow unprotected spidering by Blogspot and crawling by Google. Entries are nonetheless being added approximately 2-3 times per week. To get more followers and to find other Blogspot listings is still a mystery. This site's origin comes from from the one-time college club, S.M.I.R.K., short for Society for the Maintenance of Irrevereance towrds Ridiculous Kowtow. It is based in applied humor, i.e., jokesters, pranksters, parodists, and satirists, who take themselves seriously. [cf. their text, "The Jokingly Serious Meets the Seriously Jokable".] It also sports all kinds of untranslated French and Spanish texts (especially by Raoul Vaneigem and Jean-Pierre Voyer), all sorts of viewable films (long and short), a usable agit-prop set of graphics, and contacts. It was meant to take fun to "the next level" as interventions into the daily "production of citizens". It is a project for those who no longer wish to be content with "being", who desire to "become", and thus, is project-based, as in both "a living project" and "the project of living". This Smirkers of the World group is associated with Tribe.net group. There hasn't been much effort put here, although the created networking within Tribe is a focus whereas with many other "connectivity" and "networking" groups, the focus is merely on bringing in new numbers/quantities, so that advertising money can be attracted to extract what's not ransacked by their in-bed relations with the NSA. The smirkers_of_the_world Yahoo group was created before the invasiveness, disregard for security, and general encouragement to spammers and bullies was eposed as a core[nerstone] "feature" of Yahoo. This is primarily used as an archiving spot for many group emails which get sent to a wide range of groups and sub-group combinations. SMIRK Television is a site which will auto-stream about 20 "shorts" and not-so-short films. Any cursor activity by the viewer allows them to choose specifically what they wish to view out of the full list, and in any order. Life in a leash is no life at all. The species which denies this is against the self-evolution of freedom, against life at its very core. All of the billboarded "truths" about "wildlife" and the "wilderness" are holding up its falsifications. They hide slaughter within words like "taming" and "farming" and "superiority" with their opposable thumbs held up in the mirror, as if to say, I think therefore my reflection is all that matters. It may appear so to a heartless brain, but they don't. And their magnificent intelligence, atop garbage, carcasses, banal self-bloat, and an endless litany of bloodsoaked self-delusion, deserves what it never can find in the destruction of "lesser" life everywhere: its own supersession, its exo-parasitism. Unbecoming Things is a forum based around registered-member bulletin boards. will eventually deny membership to any Gmail, Yahoo mail, Hotmail or other off-computer mail server accounts, due to their intentional addressbook intrusions and email surveilling — compromising the security of fellow forum members — after a period of time in which they may prove the securing of their web browser access to the forum and from all access of their email by their web mail service provider; there can be no toleration for slack in the revolt against forced labor and refusing the brothelization of desire. Wonderful Squirrels is a site exploring yourself in other life, and, other life within you — which are "moments" of the same project, simultaneous instantiations of one another. It is fun[damental to] consciousness that we discover more of ourselves through others and other forms of the same life-energy. Squirrels are a wonderful moment of life becoming aware of itself. Their scampering, scurrying, leaping, quickness, alertness, ingenuity, communalism, playfulness, and social chatter are fun to engage because we see a better side of ourselves within them. Squirrels know how to be creative and how to have fun, as well as how to socially ensure their safety, survival, and that fun. They truly exemplify aspects of living which we misplaced and/or surrendered. This site is an attempt to open eyes and minds to a joyful relationship with these wonderful life-treasures — squirrels — and to the human treasure already surrendered to and/or forcibly stolen by spiritless life-parasites. It is so difficult to have a "favorite" in the 'food chain' to which life is reduced by non-evolution! My sense is that one of these days life-energy will be available to all species — who're able to make it through the "dog eat dog" and "self-cannibalizing" phase — so that none need to destroy one another to survive. All will be able to access orgonic life-force directly. This is the totalistic project which also espresses itself as "generalized self-management", "zero-point energy", "free energy", "direct democracy", and isocracy. It is the dream shared by all that is alive and all lifeforms seeking to become more so. It is the dream of a de-fragmentized life-energy, stepping into the light, crossing from dream to non-dream!